This seat is just universal seat,is not the original seat. this seat is the modified seat for Cafe Racer,maybe it have to modify a few things to make it fit your motorcycle.Fits The bikes with hump Seat. Please check the size and the color carefully before your purchase. 1 X SeatVintage Motorcycle Hump Cafe Racer Seat,features Harley Sportster Styling, Snappy Tail, Hump Styling, and Rustic black Leatherette and black Piping. 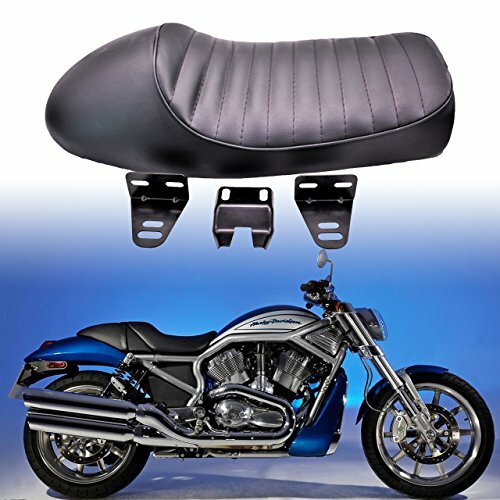 Perfect, Comfortable and Stylish seat for your ride! Thick cushion guarantees an easy and comfortable cruise. Made from Synthetic leather+PP plastic+Foam+Iron material. And The seat is suitable for all-weather condition as it’s covered with high-quality leatherette, durable, water-proof, and very very soft leatherette. Dimension:L 20.9 Inch*W 9.8 Inch*H 3.4 Inch(L 53cm*W24.8cm*H 8.6cm). Please check the size and the color carefully before your purchase. This is a universal seat. Modification to the motorcycle frame may be required to mount the seat.Includes three removable mounting metal brackets and 6pcs bolts & nuts, maybe it have to modify a few things to make it fit your motorcycle.